It’s that time of year again when we get together with those we love most. The festive season often means dining out features highly on our lists. On that note, Simply Woman were recently invited to sample the wares offered by the *Muswell Hill branch of Maison Blanc. Maison Blanc is the authentic French Boulangerie and Pâtisserie originally opened in Oxford by the master chef Raymond Blanc in 1981. They are part of the KFG chain of restaurants and have since grown to number 14 outlets in southeast England. They aren’t only a coffee house as many people believe – think ‘café come restaurant’, and you’ll be on the right track. Maison Blanc offers French cuisine offers breakfast, lunch and dinner, and they pride themselves on baking artisan breads and savouries on site. Recently they added a range of Warm Salads and Oven Dishes to their menu, just in time for Christmas. Simply Woman found the Smoked Salmon and Avocado Salad filling enough to be eaten as a standalone meal. Presentation was enhanced by sliced boiled eggs on tomatoes on baby leaves. The Roast Beetroot and Goats Cheese salad served on seasonal green leaves and tomatoes was a joy to eat. Both salads were complemented with a variety of potted sauces which included garlic and caraway dressing. Maison Blanc’s side dishes are typical of any reputable restaurant and a single serving is big enough for two. We found the fried potatoes served with potted sauce delicious. Our meal was complemented with a glass of chardonnay. Unlike the Australian variety, we found this chilled variety mild on the palate, with easy notes of apple and melon. All Maison’s wines are regional French, orderable by the glass or bottle. Decor The interiors are typically white walls with simple wood flooring. The establishment provide a ‘lounge’ area with low seating where interestingly, the brown leather decor is instantly reminiscent of the colour of coffee and other hot beverages. The dining area is pleasant, and once again, simple. We found the staff very attentive and friendly. The chatter created by the other diners also contributed to a relaxed atmosphere. Simply Woman enjoyed Tentation, which is a slab of almond and chocolate sponge soaked throughout with raspberry sauce, all covered with a layer of the finest dark chocolate. Of course, all flavours went well with espresso and cappuccino. Tarte au citron or millefeuille (traditional layered puff pastry desert) are other among other deserts featuring on the menu. 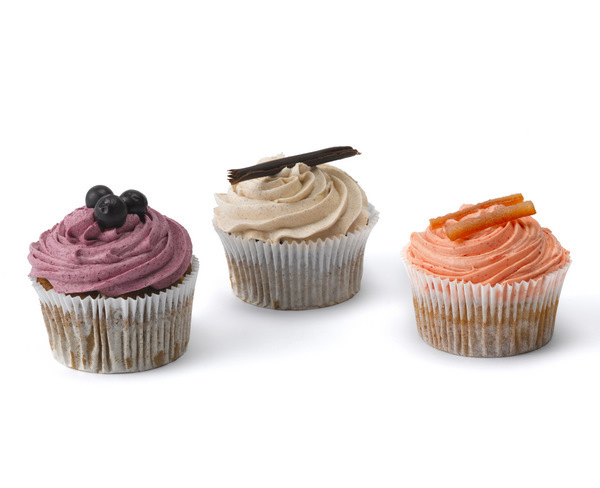 Maison Blanc’s repertoire ranges from cupcakes to traditional Xmas pudding. We tried the Xmas pressie £3.99 – a soft desert vanilla sponge and dulce de leche wrapped in dark chocolate, Jaques the Snowman £2.30 – a hard iced casing which opens to light vanilla sponge and vanilla butter cream, marzipan. The Almond topped mince pie £1.99 – was chewy and substantial. If fresh isn’t your thing, Maison Blanc has a range of longer life pre-boxed delights to suit every palette. See www.maisonblanc.co.uk to plan your seasons’ s eating the French way. Other restaurants The Muswell Hill area’s other restaurant s are mostly based in the Friern Barnet Road, a bout a five minute walk from Maison Blanc, so MB enjoys a near monopoly along the Broadway itself. Maison Blanc – 61 Muswell Hill Broadway N10 3HA (north London). Next Story → Make It An Egg-stra Special Easter with Prestat’s Royalty-Endorsed Chocolate Delights.